On the morning of April 25, the Pitmen conducted another training session in Vorzel. We want to note that Bernard has returned to the general group. This evening, the Orange-and-Blacks will go to Kharkiv for the domestic Cup semi-final. Shakhtar have been training in a good mood after defeating Dynamo in the league. At the post-match press conference, Paulo Fonseca noted that he has a lot of respect for Dnipro, who showcase spectacular football. Today, the Pitmen are fully focused on the cup match against the opponents who have not lost since last November. Dnipro have produced an 11-game unbeaten run. The last team to beat Dmytro Mikhailenko's outfit were Shakhtar (on November 27, 2016). Immediately after that meeting, the Blue-White-Azures defeated Vorskla in the quarter-finals (1-0 thanks to the goal by Denys Balaniuk), then beat Zorya in the league (3-2) and nicked points off Olimpik 1-1). In the spring part of the season, Dnipro held 8 games. Six meetings ended in a draw. Already in April, the Pitmen’s opponents got three points in the games vs Zirka (1-0) and Vorskla (2-0). The teams had a total of 15 meetings in the Ukrainian Cup. 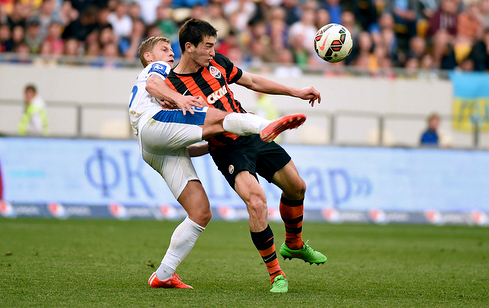 Shakhtar won 8 times, with Dnipro emerging victorious on two occasions and another 5 games ending in a draw. The goal difference is 24-10 in favour of the Pitmen. On May 20, 2015, the encounter in Lviv was Dnipro’s final rehearsal before the Europa League final vs Sevilla. After the 1-0 first leg win at the Dnipro Arena, Shakhtar saw it through. However, the game was very difficult. In the 30th minute, Kalinic brought his team in front through the pass produced by Fedorchuk. The Pitmen created a number of chances, but Srna's attempt was parried away by Boiko, with Stepanenko hitting the crossbar and Marlos firing it inches off the post. The decisive was the 77th minute, when Kankava pushed Gladkyy in the back using both hands in the penalty area, with Luiz Adriano converting the spot kick to make it 1-1. The Pitmen play Dnipro in the semi-finals for the sixth time. Dentinho may make his 100th appearance for the Orange-and-Blacks. Buy tickets for the match at the ticket office of OSC Metalist (from 9:00 until 20:00, no breaks), on shakhtar.com and the club’s partner sites.